Submitted photo Members of the United States Air Force Band of Flight. WRIGHT-PATTERSON AIR FORCE BASE — The U.S. Air Force Band of Flight will perform a free country concert with American Idol contestant Alexis Gomez beginning 7:30 p.m. Saturday, Oct. 13 at the National Museum of the U.S. Air Force. Gomez, a graduate of Centerville High School and Wright State University, was a Top 16 finalist on Season 14 of “American Idol” in 2015. She went on to compete as a Top 10 finalist in “Nash Next” in 2016 and 2017, and has continued her singing career following these competitions by performing around the local area this summer. The multi-instrumentalist has been singing for as long as she remembers and has opened for artists including Randy Hauser, Midland, Montgomery Gentry, Cassadee Pope, Clint Black, Old Dominion and others. However, according to her website, www.alexisgomezmusic.com, she is much more than just another fresh voice for country music. 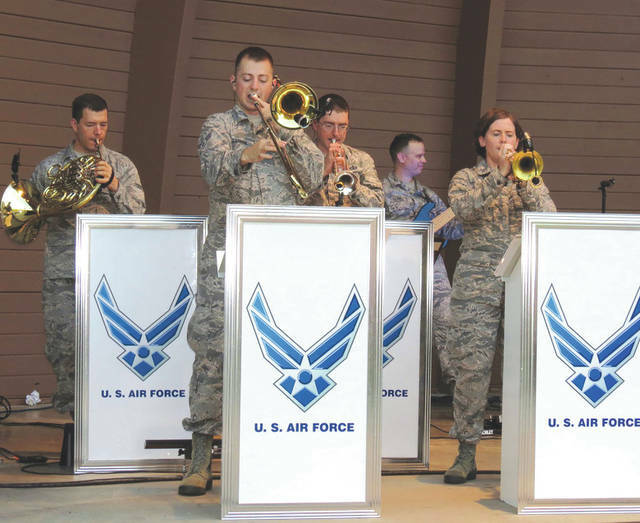 The United States Air Force Band of Flight, stationed at Wright-Patterson Air Force Base, presents more than 240 performances annually, providing quality musical products for official military functions and ceremonies as well as civic events and public concerts. Since its founding in 1942, the band has performed for presidents and vice presidents, visiting heads of state, cabinet officers, members of congress, U.S. and foreign military leaders and millions of Americans. The concert will take place in the museum’s second building and last approximately 80 minutes. Due to the popularity of these free concerts, tickets are required and limited to four tickets per person. Public distribution will begin 9 a.m. Tuesday, Sept. 11. Requests made before this time will not be accepted. Tickets may be obtained one of three ways. Beginning at 9 a.m. Sept. 11, requests can be made in person at the museum 9 a.m. to 4 p.m. Monday through Friday. Those who cannot make it in person may request tickets by visiting www.nationalmuseum.af.mil/upcoming/events/ or by calling 937-904-9881. Those requesting tickets must provide their name, phone number, mailing address and the number of tickets they would like mailed to them. The tickets will be mailed beginning Monday, Sept. 17.
https://www.fairborndailyherald.com/wp-content/uploads/sites/50/2018/08/web1_180830-F-FN604-001.jpgSubmitted photo Members of the United States Air Force Band of Flight.